Do not forget to set the component schema to auto propagate using COMPONENT SCHEMA_AUTO_PROPAGATE ="true". 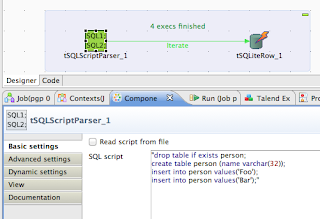 Bottom line I have found that the schema must be editable so in Talend custom components in order for them to be pre-populate or even available to following components. Failure to do so will result in empty lines as the schema will be missing and so there would be no place to flush the output. What is eating my HDD? That is a common question I hear. The response to it is pretty simple. Just search for big files or directories containing a lot of information. Ubuntu as any other OS should be upgraded when the time comes. Keeping an unsupported version of the OS is a no-no. Yet for whatever reason it looks on the technology side we need to deal with upgrades in servers that have not been patched. When you say that the solution is an upgrade and that it will take longer the statement, believe me, will be not appreciated. In those case you better try to correct the issue even if providing a non-secure solution and later state what should be done ASAP to avoid possible exploits to compromise your outdated servers. Package nfs-common is not available, but is referred to by another package. Now you should be able to install that package which was missing in your old distribution. However let me state this once again, you should never rely on this procedure. You should always upgrade your distribution. To safely upgrade the distribution I believe automated server management in terms of recipes is the way to go. The way your Java program deals with external command invocations can be Runtime.exec, java.lang.ProcessBuilder or calling a web server wrapper that avoids huge memory leaking (JVM-Fork() problem) as I have posted before. If you are using Runtime.exec without arrays for parameters then most likely you will face an "IllegalArgumentException" starting with version 1.7.0_21 in Windows platforms. The message states "Executable name has embedded quote, split the arguments". The solution as explained by Oracle is to use an array if you stick to Runtime.exec or migrate to java.lang.ProcessBuilder. Please refer to http://www.oracle.com/technetwork/java/javase/7u21-relnotes-1932873.html#jruntime for details. I ignore if java7 has already corrected for good the momentary overcommit of swap space as a result of using fork() but we have found using the wrapper mentioned above has done the trick so far for us but for sure using a wrapper is not always an option. Now you should be able to explain why sometimes your executables might come back from SVN without the +x flag/bit. If you are using an IDE you will need to look at what it is doing behind scenes with a file. For example if you copy an existing file with the svn executable flag from Eclipse into a new file, once Eclipse commits the new file it will end up with the right svn flag on SVN. If on the contrary you create a brand new file in Eclipse, commit that file and later on you change the file permissions, then Eclipse won't set the svn:executable flag. This is the behavior for at least the subversive plugin (the one I currently use). I would say this functionality (SVN Client to automatically set the svn:executable property obeying the file system execution bit in Unix/OSX/Linux) is a good candidate for a feature request if you ask me. What IDEs would do this for you? Good question for a community forum. Probably it is worth mentioning that when you checkout or export an existing file containing the svn executable flag, the subversion client will set the OS executable bit for you. Simply put give the applicant an NDA and hire him/her as a consultant. Assign her/him a task that creates value for your company, do not go with a pet or PoC project, that is just waste you should eliminate in your lean process. You need VDI for this. You want an isolated Desktop with access to few resources, no clipboard availability and proxy controlled access to the web. You want to make sure the person you are hiring will not go evil. Pay the Applicant (now the Consultant) for her/his work and if you like the outcome (which goes beyond human relations, commitment, availability, hard work, knowledge ...) then approve her/him. When the new member joins the team there is already confidence in all parts involved, there are no surprises. IT personnel are knowledge workers. You should have a layered infrastructure, architecture and SDLC in place respecting Separation Of Concerns. If you do so, then you should be able to define tasks that demand little or no knowledge of the current services you provide or the nature of your business. That translates into new team members that are less stressed, who provide value day one and who only keep providing more and more gradually as they learn. While the technical manager discusses the intrinsics of the first few tickets that will help with your project there will be a full understanding of the capabilities of the applicant. The applicant himself will understand if this job is the right one, if the technology stack makes sense to her/him, if s(he) sees potential for growth. It is a win-win situation. We should all learn from the Automobile Industry. It is easy to build a Software Shop. It is not that easy to build a Software Factory. Let us practice an agile approach to hiring. Lean processes start at hiring and they go all the way up to to Strategic Planning. Agility in SDLC is not enough to make a business succeed. When you need to run multiple sql statements you commonly use sql scripts that are supplied to the SQL Engine. The Engine is optimized to digest those in one or multiple "batches". 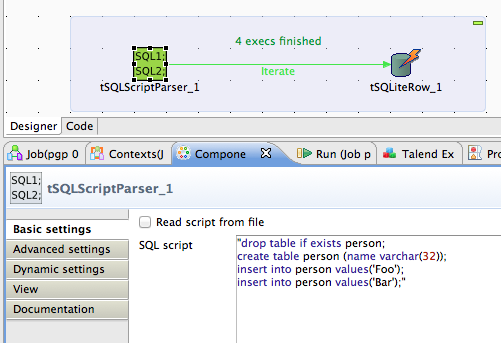 There is a solution for MySQL as the tMySQLRow component supports batching through the option "allowMultipleQueries". Not for tSqliteRow or other other components though. From Talend we could invoke the Engine directly but at the time of this writingTalend lacks support for internal resources definition..
Download the component and install it. Ubuntu 12.04 WARNING: The following packages cannot be authenticated! Sometimes you need to delete the repositories list, reimport the keys, clearn, purge, update, upgrade ets. Just Google about this error to convince yourself about how many things could be originating this issue (or similar). Some other times there is security imposed in your network by devices and/or appliances which will interfere with the upgrade. Especially firewalls use either Proxying and Packet Filtering and those might be the culprits. If you face this error I would recommend installing the same version of the OS in a same-subnetwork-machine and compare the results with an installation in a machine in a different network. You might have to run strace, tcpdump and God knows what else before you convince the Firewall admin that there is something funky going on with the Network. I just released another useful recipe where bash simplicity shows up. Just the way the command works that is the way you use it from bash, no wrapper. Simple, fast, agile.